EghtesadOnline: A senior official says Iran will live up to its commitments under the 2015 nuclear agreement as long as its interests are safeguarded as the US is imposing back-to-back sanctions on the country. 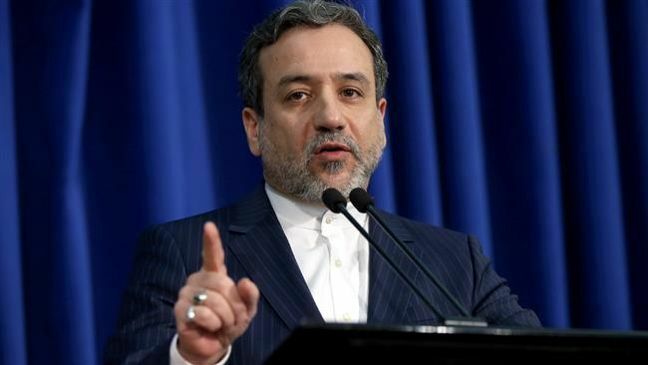 Deputy Foreign Minister for Legal and International Affairs Abbas Araqchi told a TV program on Saturday night that the new US sanctions "have not completely endangered the Islamic Republic’s interests" yet. "Whenever our costs in the JCPOA become higher than our interests, we will not be bound to fulfill our obligations," Araqchi said, referring to the Joint Comprehensive Plan of Action as the nuclear accord is known. According to PressTV, his remarks come after both the US House of Representatives and Senate overwhelmingly voted earlier this week to levy new sanctions on Iran over their ballistic missile programs, with President Donald Trump set to sign the bill into legislation. Araqchi said the congressional vote was a hostile move which would elicit Iran's "decisive" response proportionate to the sanctions. On Saturday, an Iranian parliamentary committee on national security and foreign policy held an emergency session and decided to put the general outlines of a motion on countering "US terrorist and adventurous measures" in the region to debate. Araqchi said the Americans are mistaken in thinking that the JCPOA is Iran's only tool against US pressures, and thus provoking the Islamic Republic to leave the 2015 nuclear accord. Tehran, he said, has many instruments to respond to the new US measures. "It's unreasonable that the Americans lay down such a harsh law against Iran and do not know that we will defend our power components because Iran is strong in the region and internationally and it has this power from the JCPOA," Araqchi said. "America must know that we are not about to commit self-injury with regard to the JCPOA. Whenever the commitments of the opposite side are not fulfilled, it means that a flagrant violation has taken place and we will then continue our enrichment again," he added. The nuclear agreement was inked between Iran and the P5+1 countries — namely the US, Russia, China, France, Britain, and Germany — in July 2015 and took effect in January 2016. The Trump administration, which took over in January 2017, one year after the JCPOA came into force, has described it a bad deal and pledged to "push back" against Iran. "The Americans are talking about the 'pushback policy' against Iran in their speeches," Araqchi said, adding the US wants to prevent Iran from growing stronger. The senior nuclear negotiator said the US president and his administration are after scrapping the JCPOA, but they want Iran to pay the costs. Araqchi said US sanctions have made Iran’s Islamic Revolution Guards Corps (IRGC) "stronger and self-reliant." "The enemies have targeted the IRGC in order to weaken it, but they would die in frustration," he said.